The Grand Canyon really doesn’t need an explanation—the name says it all. 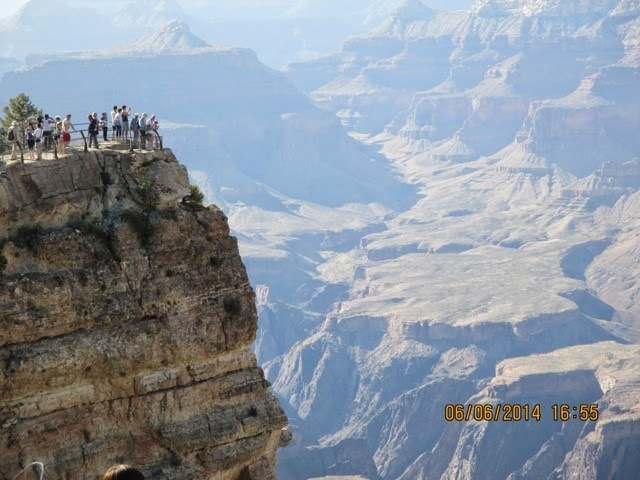 You stand at the edge and look, and it’s self-evident why it’s one of the Seven Natural Wonders of the World. A week ago Steph and I, along with her parents, took our son to see the Grand Canyon for the first time. What an experience. As we walked up to the rim, his reaction was priceless! We didn’t descent from the rim during the trip, but you can’t help but admire the views whether it’s your first visit or not. The scale of the Canyon is almost inconceivable. 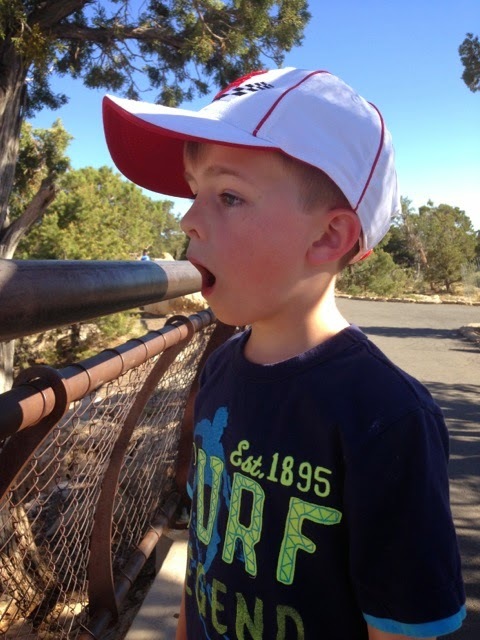 One of the best things about the trip itself was the US National Park Service’s “Junior Ranger” program. When we checked in at the Visitor’s Center, they provided me a book for him with a number of educational requirements that had to be met to earn a Junior Ranger certificate and badge. Needless to say, Paul was excited as we showed him the book. Activities were based on the age of the child and broken into categories named after different animals. 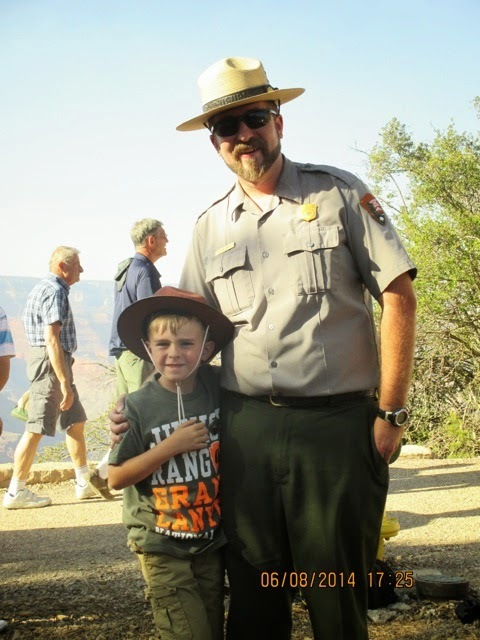 For his age, he had to attend at least one presentation by a Ranger, write and draw what he learned from the presentation, and complete four other tasks oriented toward focusing a child his age on aspects of nature and the Canyon itself. We ended up attending two Ranger presentations. The first full day we were there Paul selected a presentation about fossils. 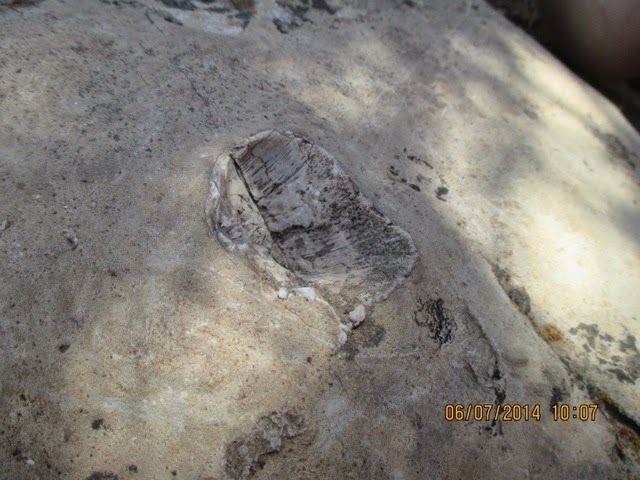 At the appointed time, we met with Ranger Mike and took a short walk from the Bright Angel Trailhead to a large fossil bed, probably less than a half mile away. 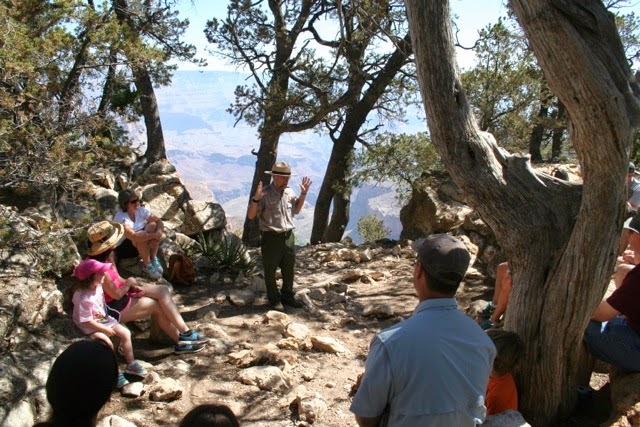 Along the way we stopped and sat on the rim while Ranger Mike talked about the geologic history of the Canyon and how it formed, the rock types present in the Canyon, and why we’re able to find so many fossils today. Then everyone was up and walking again and in just a few minutes we were standing in the fossil bed. 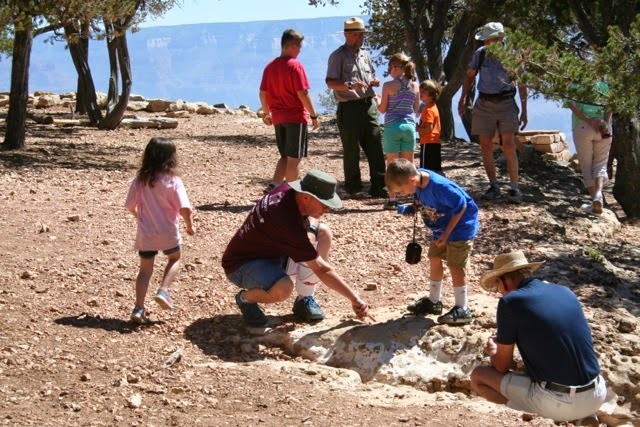 Ranger Mike described the five types of fossils we could find, then made it clear to the kids that all of them would find and see an example of all of them. The parents all seemed just as interested as their kids, but we had a moment of levity when Ranger Mike told the kids, “as our time goes on, if we haven’t seen a particular kind of fossil, you might want to look where the Ranger is standing.” Kids were excited to know they’d get a hint; parents were happy that our guide wouldn’t let the lesson go too long. The kids had great eyes though and within about 15 minutes everyone had seen all five fossil types. At the end, Paul had to answer several questions in his book detailing what he had learned and present it to Ranger Mike to check. 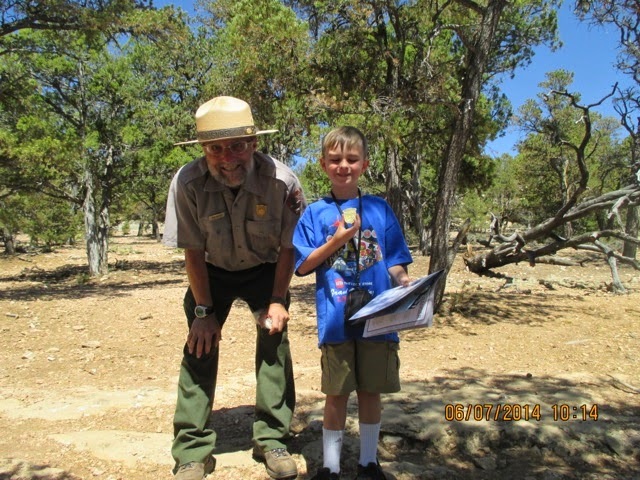 Since Paul had already completed the other tasks, Ranger Mike signed his certificate and presented him his Junior Ranger badge. Paul was thrilled! The next day we attended a second presentation on the California Condor with Ranger Ty. It was as well-done as the fossil class. We gathered again near the Bright Angel Trailhead at the time of day that the California Condors are known to return to their nests after a day of scavenging. It was amazing to hear how there were only 22 (or so) of these amazing birds at one point after the population had all but disappeared primarily due to toxins in their food supply. 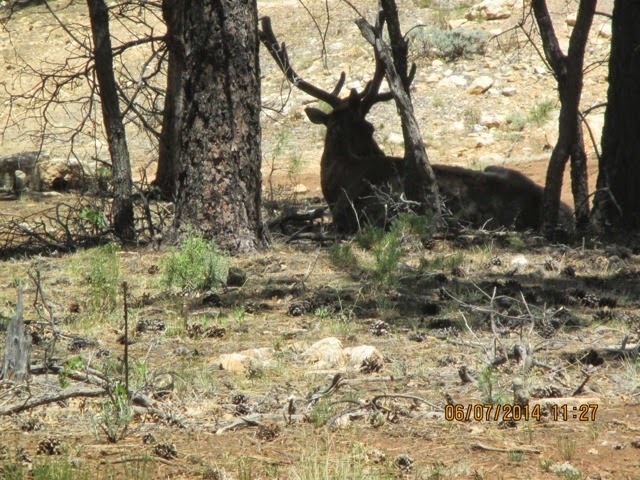 Through a captive breeding program there are now approximately 400 birds total, spread across several locations, but primarily living in the Grand Canyon. While they’re still endangered, all the indications are they’re moving confidently toward eventual removal from the list of endangered species. Ranger Ty taught the kids (and adults!) how to tell the difference between the California Condor, the Turkey Vulture and the Raven, all three of which are present in the Canyon. He talked about the history of these birds and used kids to show us just how big they are,standing about four feet tall with a 9-10 foot wing span! He also explained the breeding and tagging program as well as the role of the Rangers in public outreach to help reduce the toxins that get into the Condor’s food. Sure enough, while we sat and listened we had the privilege of seeing two California Condors! 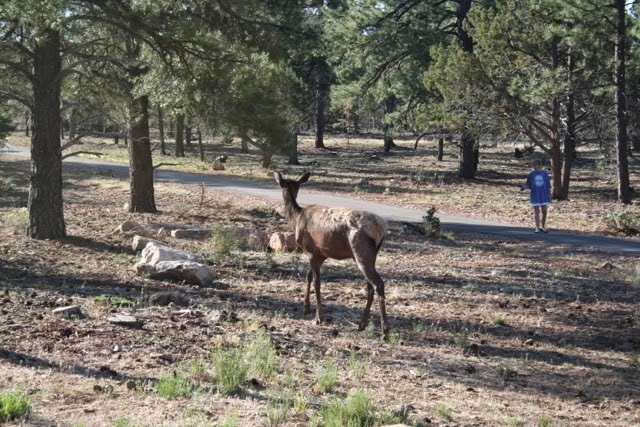 To make it all even cooler, just by walking around in and near our campsite, Paul was able to see a make and female Elk, several lizards, squirrels, and a variety of small birds. He also made friends with a boy with a family camping next to us and ended up putting more miles on his bike in a weekend than he’s put on there the entire rest of the time he’s had a bike. It was a wonderful weekend of rest, education, and fun for all of us! 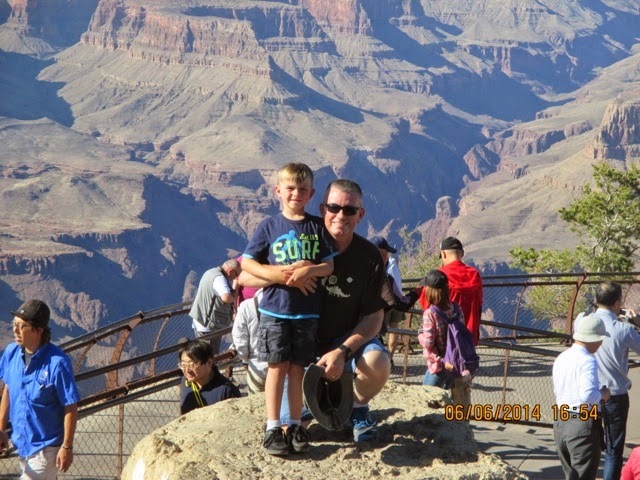 I have no doubt Paul will remember his first visit to the Grand Canyon for the rest of his life.